Orange Buttermilk Pancakes-light and fluffy pancakes with a hint of orange served with whipped orange honey butter make a perfect spring breakfast! Originally I got up recently and was going to make a big stack of buttermilk pancakes for Sunday breakfast. I got into the kitchen, pulled out the skillet and all the ingredients when suddenly I wasn’t feeling it, I wanted pancakes with a fresh twist. These Orange Buttermilk Pancakes are light and fluffy and oh so delicious! 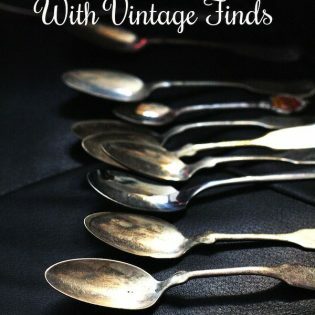 We all loved them and have even polished off the extra orange pancakes I put in the freezer! You can definitely eat them as-is but I highly recommend smearing them with a little whipped Orange Honey Butter and a drizzle of maple syrup! These just might be one of my favorite pancakes yet……….next to pumpkin pancakes. 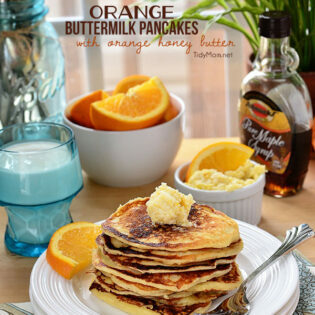 Orange Buttermilk Pancakes would be perfect for an Easter or Spring breakfast or brunch. TIP: The secret to fluffy pancakes is to make sure the batter remains a little bit lumpy. Too much stirring will create a tough pancake. In a small bowl, combine the baking mix and sugar. In another bowl, whisk the egg, yogurt, buttermilk, orange juice, butter, orange peel and vanilla. Add the buttermilk mixture to the dry ingredients, stirring just until moist; let stand 15 minutes at room temperature. if you don't have buttermilk, you can add 2 teaspoons of white vinegar or lemon juice to 3/4 cup milk. Stir and let stand 5-10 minutes. Use curdled milk in recipe. This pancake flavour is fantastic!! So yummy! Such a bright sunny breakfast to wake up to. 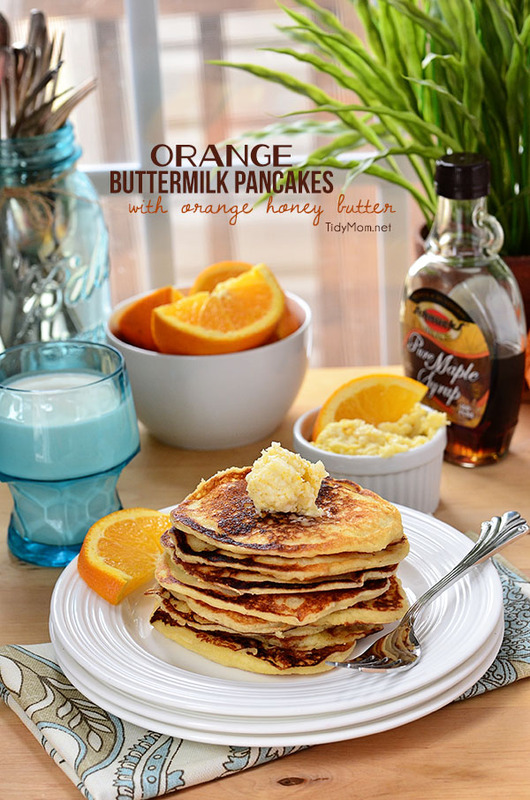 I LOVE buttermilk pancakes, and the orange addition sounds perfect! A great, spring breakfast! Thanks for the fluffy pancake tip as well..pinned! I want a big stack! Cheryl! These sound AMAZING!!! I bet that orange just tastes so fresh…and then you can eat more, right? Fruit? YES?!? Thanks for sharing my reipes, Cheryl. These look fantastic! I love the idea of orange scented pancakes Cheryl – perfect for Spring! These look so good. I love the color and how thin yet fluffy they stay. Now this sounds like a good breakfast for today! Pinned! YUm! I love orange flavors! Lumpy is good. Who knew?! My batter’s often lumpy b/c I make it by hand. These are gorgeous. Love the orange and the burnt parts. This is a stack of pancakes I need delivered to my door…like now. Omg, yum!! 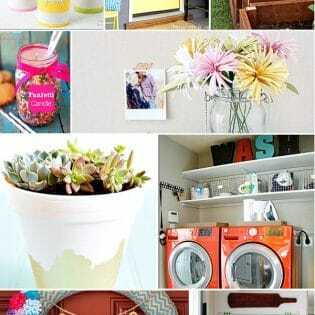 I’d love to wake up to these every morning!! Your photo is making me so hungry! This looks amazing! Sharing on fb today!! !